Week 7 I was traveling and this resulted in me forgetting to post a preview for week 7 (and week 8) and also forgetting which players were playing on which day. Thankfully it didn't cost me in the end but boy was it close! 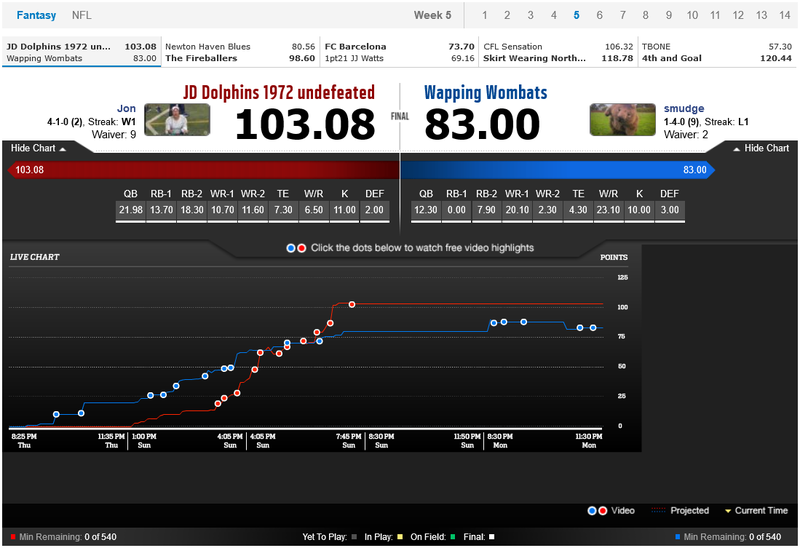 The game this week swung back and forth like a pendulum, I started off out in front with two players involved in the Thursday night match-up, then the first glut of Sunday games reached the end of the first quarter and I was behind. By halftime I was back in front thanks to a Michael Crabtree TD, but as the games wound to a close I found myself quite a way behind with only a RB and a K to play. Freeman started off slowly but a few nice runs in the second half proved to be game winning (for me if not for the Falcons) and I sneaked over the line ahead of my opponent. 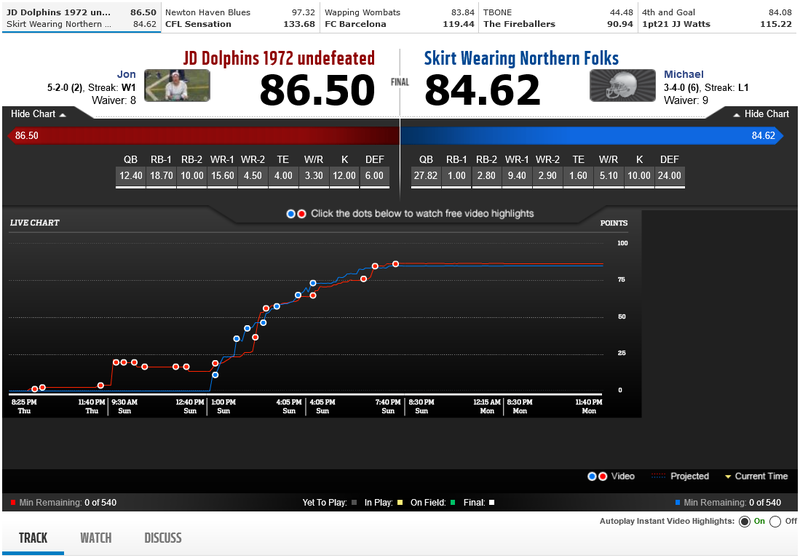 This was the closest game in the league this season, with a winning margin of only 1.88 points. 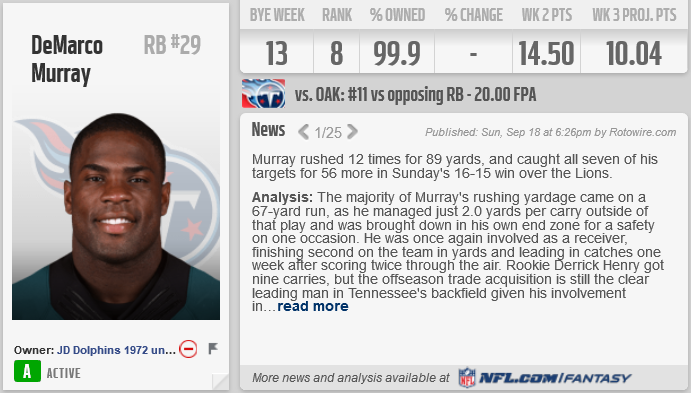 In three out of the last four weeks DeMarco Murray has been my leading points scorer, he is Mr. Consistent although he really should not have had to carry the team this week. There were a couple of real difference makers that I left on the bench, although we will cover that later. 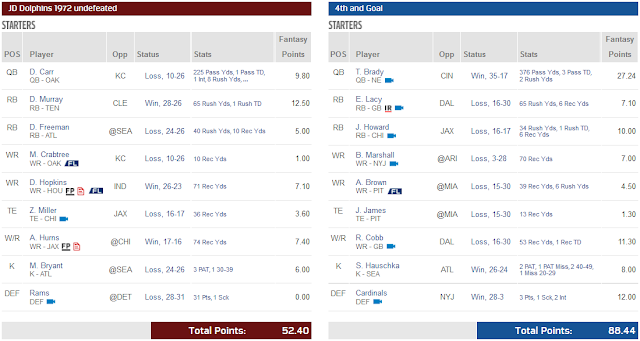 I really felt for my opponent Michael after this one as he had two brilliant performances (Andrew Luck and the Philly Defence) wasted by the fact that the rest of his team failed to step up in any way, but at least I still got the win! It was another disappointing week for Derek Carr, his early season promise is foundering on the rocks of a slightly more difficult schedule. However, this week he was up against Jacksonville and really should have been able to put them away. 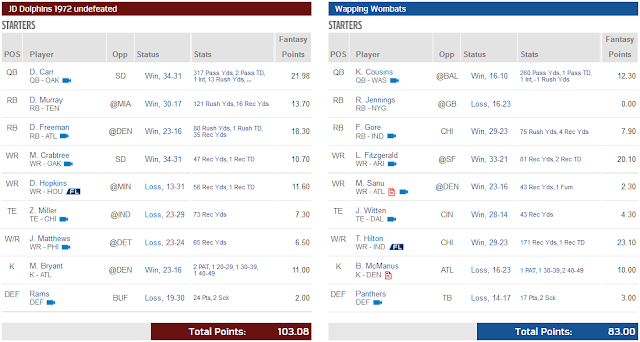 What really stung about this one though was the fact that I had Jameis Winston in as starter until about 30 minutes before kickoff, at which point I had a crisis of confidence and fell back on old faithful. 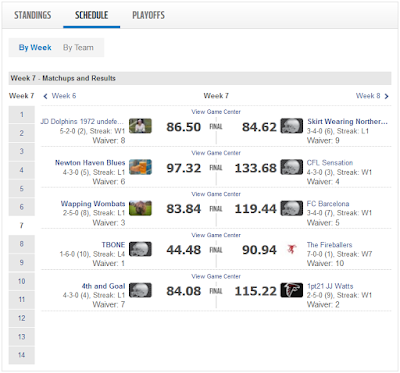 Next week Winston and Carr face off and right now I just don't know who I will pick as starter. DeMarco lead the way and Freeman managed to pick up his game in the second half of the Falcons/Chargers game to really win me this tie. Before the season started there was a lot of talk about the "zero RB" draft strategy but this position has managed to save me more times than I think the advocates of that strategy would like to admit. When I review the season next year it will be interesting to see just where the RBs fall in terms of overall points, would a more WR or RB centric strategy have served me better? Right now I am just glad that these guys are on my team, especially with Doug Martin still nursing a hamstring injury. For Michael, neither Terrance West nor TJ Yeldon managed to step up in any meaningful way in this game, managing a grand total of 34 yards on the ground and one reception of 4 yards. OUCH! 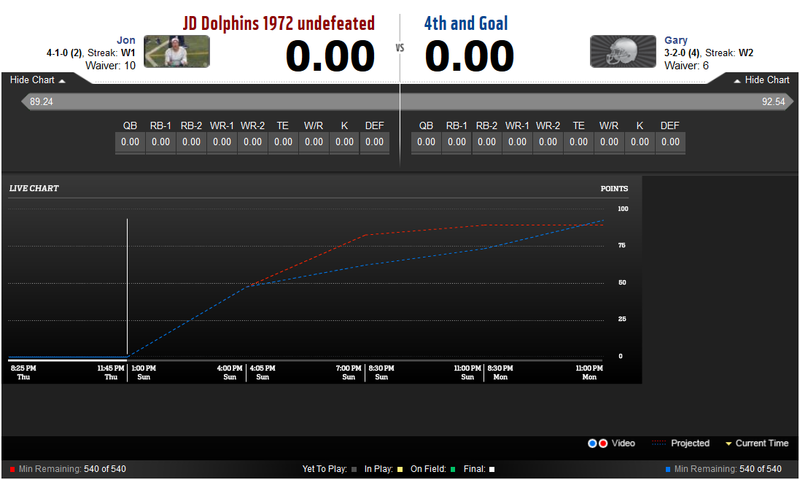 TDs can really change a fantasy match-up and that was the case in our WR battle. For the first time since week 4 Marvin Jones managed to pick up more than 40 yards for my opponent, but his yardage contribution was matched by Michael Crabtree who also picked up the sole passing TD for the Raiders. Crabtree's performance was a double whammy for Michael as it limited his second WR, Amari Cooper, to only 29 yards which was surpassed by Allen Hurns for me. 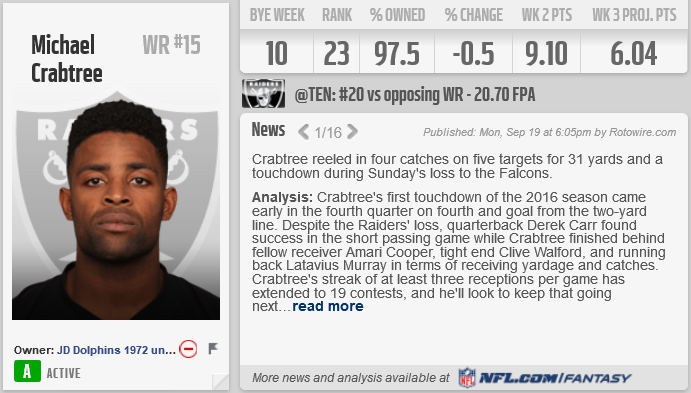 Crabtree has been almost as consistent for me as DeMarco Murray with only last week's awful performance eating into his overall reliability. This time out he was back to his usual 3+ catches and 10+ points, I just hope that he can keep it up for the remainder of the season. The Tight End position has really stunk this year, unless you have someone playing for New England (or Greg Olsen) then they have really failed to contribute anything to your team on a consistent basis. Zach Miller added an average 4 points to my eventual total but Hunter Henry, who had started to look like a breakout option in the previous 3 weeks, only managed 1.6 points in week 7 for my opponent. New England may start to look for ways to exploit their two TE sets over the remainder of the season, especially with Brady back under center, and hopefully I can exploit this with a sneaky pick up of Bennett who has somehow found his way into Free Agency in the Limey League. Matt Bryant had another strong game, and it could have been even better if he had made the game winning field goal! Once again Atlanta gave him the opportunity to put up points and the veteran didn't disappoint, well except for that missed game winner. He has been a decent pick up for my team and if Atlanta can keep things rolling he should continue to put up points in bunches. LA continue to be undermined by a weak offence and now the injuries are taking their toll as well. This week saw a bend but don't break effort against the Giants and things could have been so different in London for them if they had just had a little bit of support on the other side of the ball. The Eagles defence really did a number on Minnesota for Michael, picking up points in every available category. They have been quietly going about their business this year and they have put up very strong numbers week in, week out with only Minnesota ahead of them. 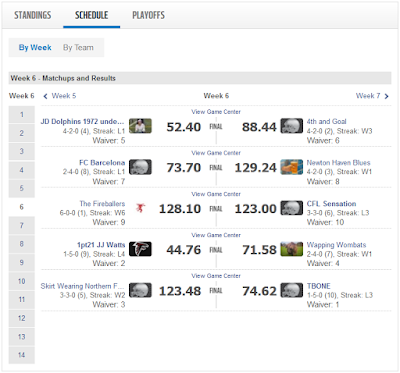 I will need to find some similar production over the next few weeks if I want to have any hope of making the playoffs. 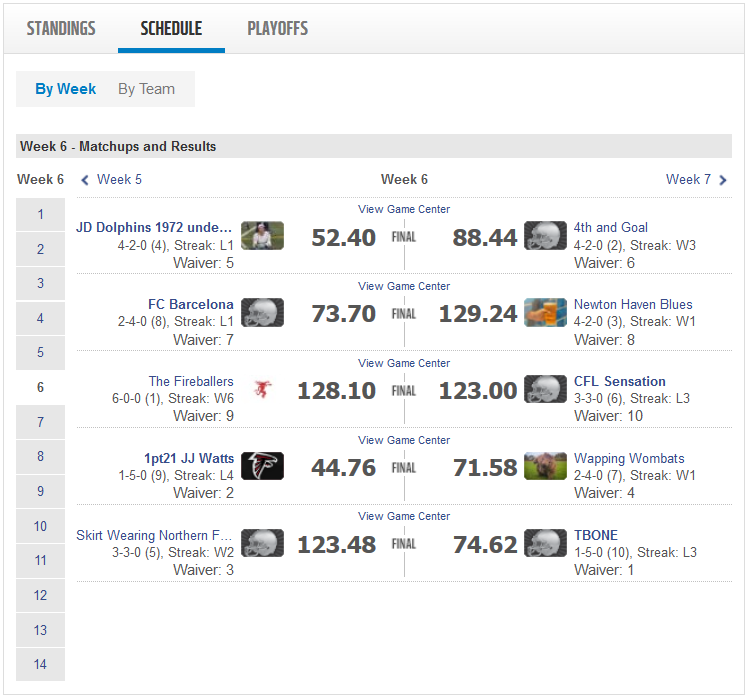 I have already mentioned Winston and Ajayi as two players who should have started for me. The final starter who I benched was Travis Benjamin who managed to avoid fumbling the football this week on his way to picking up 54 yards. Dropping Hopkins and Matthews was the right call as neither put up good numbers against two of the best defences in the league and Doug Martin continues to sit out with a hamstring injury rounding out my bench. 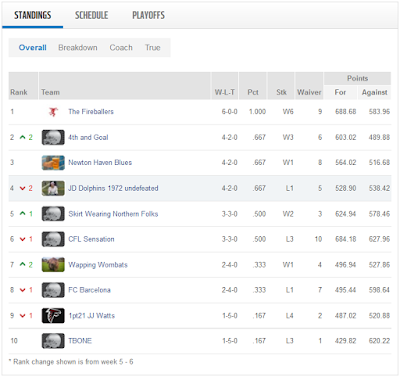 I'm back up in second and CFL Sensation are the biggest climbers this week jumping all the way up to third. Newton Haven Blues drop out of the playoff picture this week but with everyone having winnable games next week it could be my Dolphins that drop out of the playoff picture in week 8. So there were some big scorers this week, with CFL Sensation leading the way. A couple of the teams lower down the table had big weeks, with 1pt21 JJ Watts really throwing a spanner in the works for 4th and Goal. Next up for my Dolphins are the undefeated Fireballers. Hopefully we can put that first blemish in the loss column for them to keep ourselves ahead of the chasing pack, especially as week 9 sees us take on CFL Sensation who have bounced back from their blip over the last two weeks to revert back to their early season strong performances. So this week anything, and everything, that could go wrong did go wrong. 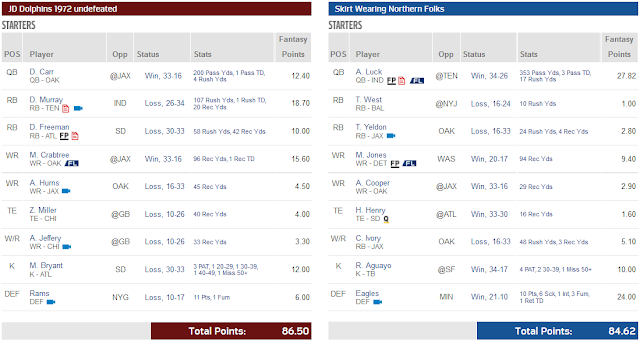 A resurgent Tom Brady took down the majority of my team singlehanded. Everyone underperformed. Everything. Ugh. One player managed to get into double figures, yup it was that sort of week... Frustratingly, this was the sort of game I could have won if only a few of my players had lived up to the modest expectations predicted before the games kicked off. Derek Carr started off well enough against Kansas before with a TD right at the start of the game. After that it all went downhill, two turnovers and not a lot of yards later he had lead Oakland to their second loss of the season. Hopefully he can bounce back next week against Jacksonvillle. On the other side Tom Brady was Tom Brady, and he could easily carry 4th and Goal (and the Patriots) into the playoffs. The ever reliable DeMarco Murray picked up my solitary TD this week, although he was held a long way short of 100 yards by Cleveland. 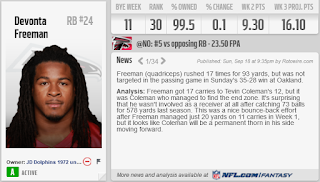 Devonta Freeman managed 50 yards against Seattle, but he never looked like kicking it up a gear against the Seahawks. The combined totals of both teams would have been a respectable total for a single WR1, unfortunately neither of us could be happy with the performance of our WRs. Crabtree only had two catches for the first time since the middle of last season and even worse only 10 yards... Hopkins did a little better with 71 yards, but that was not nearly enough for an early round draft pick who has been disappointing since week two. Zach Miller had an average outing for a TE, my opponent had to scour the waiver wire and pick up Jesse James after Jordan Reed was ruled out in the concussion profile. TEs never seem to make or break a team but decent performances are always appreciated. Hurns justified my choice to start him, more than my other 2 WRs, but he wasn't quite as good as Randall Cobb, who grabbed a TD. I feel that a run of TDs are just around the corner for Hurns and I really hope that I can take advantage of it and push on towards a playoff spot. A disappointing performance from Atlanta lead to a disappointing score for Bryant. Hauschka missed two kicks but was still able to outperform Bryant on the day due to the greater number of opportunities granted to him. San Diego next week should be a nice remedy to the issue. The bench was pretty much a non-story this week. Jeffery and Matthews could have contributed but neither had enough points to make any difference to the final result. Matt Jones would have been a brilliant start for my opponent, but in the end he didn't need him. Travis Benjamin continues to have issues with fumbles, 3 in four weeks is unacceptable for any player at this level and I can't help but think that these issues will catch up with him and take away his opportunities in the San Diego offence. 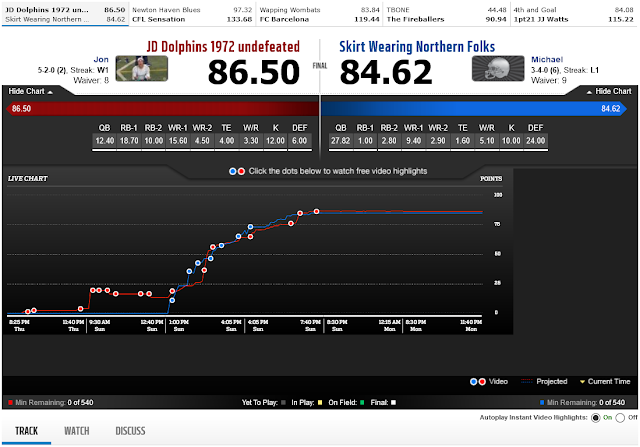 Another week has rolled around quickly and my Dolphins are looking to keep up the pressure on the only undefeated team in the league. at 4-1 we are the only team within one win of the league leaders but this week sees us take on a tough match-up against a resurgent 4th and Goal. For the second week in a row there has been some action on the waiver wire for the Dolphins, adding players who may make more of a contribution down the line rather than this week. This one was technically a late waiver move in week 5 but as it did not come into play that week I have included it here. 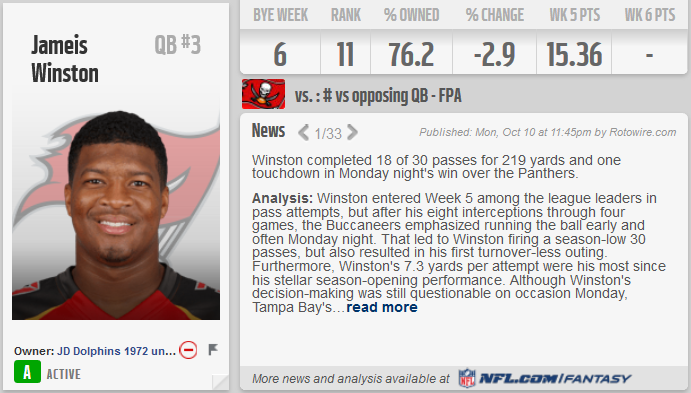 Winston has had an up and down season so far this year. 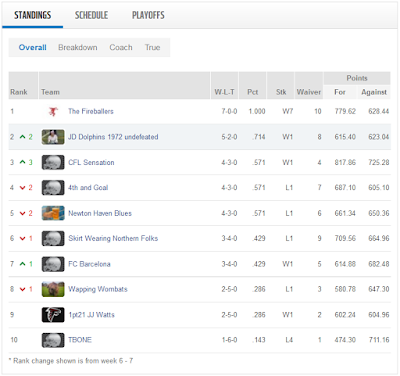 A strong week 1 was followed by a disastrous week 2, the same patter followed in weeks 3 and 4 before a decidedly average performance in week 5. There are a few key things to consider at this stage though, firstly, Winston has been without his number one RB since the first quarter of week 2, when things went downhill fast. Sure Sims was OK but Doug Martin adds an entirely different layer of dynamism to the Tampa Bay offence. Martin will be back for Tampa's next game, after their week 6 bye, and will take a large share of the load off of Winston freeing him up to do what he does best on a football field. I mentioned the bye just now and that neatly brings us on to point two. This bye week leads into four relatively good games for a QB to face. San Francisco, Oakland, Atlanta and Chicago all have some question marks in their pass defence, Atlanta are arguably the best of this bunch, and if Winston can protect the ball and make plays he has the opportunity to put up 20+ points each week. And that brings us on to point 3, protecting the ball. Week 5 was the first week that Winston did not turn the ball over. Keeping the ball safe was a massive problem for Winston in weeks 2-4 (sans Martin) where he lead the Bucs to 6 TDs but turned the ball over an unacceptable 9 times (7 INTs 2 FF). No turnovers in week 5 was a good thing, if he continues it through week 7 it will be better. A tough move to make this one. Cairo didn't do anything wrong, he just had a badly positioned bye week. Matt Bryant became available and with that high powered Atlanta offence he will have a lot of opportunities to put up points. Kansa will still generate opportunities for Santos but when the number 2 kicker in the league falls into your lap you have to make way for him and carrying two kickers seemed redundant at this stage of the season. Allen was on my draft board at the start of the year, so when he became available I knew that I had to add him. He has had a quiet season so far, with only one TD to his name. Coming off of their Bye week Jacksonville travel to Chicago to face a beaten up Bears secondary. If Hurns is going to get the TDs flowing this is the game to start it, their are question marks over the health of two of the CBs in an already depleted Chicago defence, and next week Hurns will face off against an Oakland D that loves to give up big points to WRs. A no brainer right? Another tough call, Pitta has been decent, if unspectacular, this season on his return from two hip injuries. The only reason to make this move is that Brian Hoyer is set to be the starting QB for Chicago for the rest of this season. This should mean big points for Zach Miller and his short to intermediate routes. 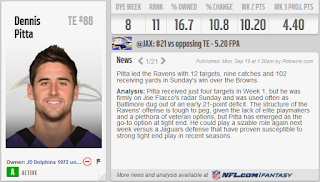 Pitta could return ahead of the Chicago bye week as I will need another TE but as of right now there wasn't a spot for him on the team. 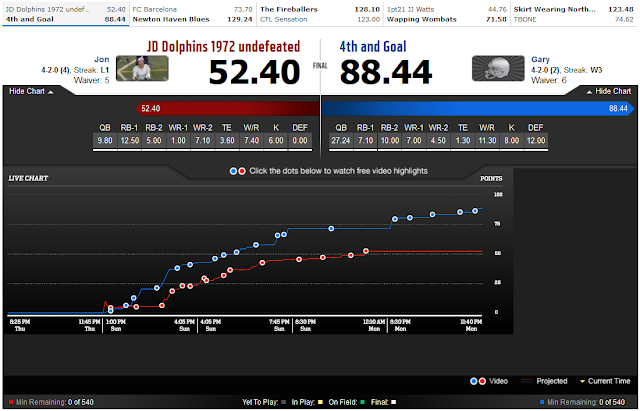 Another close game, which will probably come down to a big day or two on either side. So let's take a look at the teams. Derek and the Raiders welcome a Kansas City defence that has so far struggled to live up to expectations in 2016. Don't get me wrong there is still talent on this team but I get the feeling that the name strikes more fear into opponents than the actions right now. Marcus Peters returning to Oakland has been the buzz online this week and I expect him to match-up against Amari Cooper for the majority of the game. Of course Derek and co have far more weapons than that and you would expect them to be fully utilised as Oakland look to go 5-1 themselves. 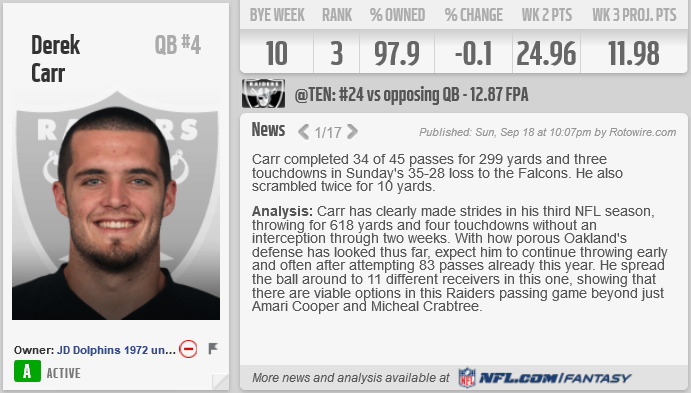 A 13 point projection seems low for Carr especially when you consider 4 out of 5 weeks he has had 20+ points and averages 20+ a week even when you include his sub par week. Opponent - Tom Brady (Proj. 17.74) - Yep I get to face the Tom Brady revenge tour, week two. They're up against a Cincinnati team struggling for an identity this season. Brady and co will be looking to win this one and my only hope is that they decide to run the ball through Blount more than last week, taking some of the points away from Brady. DeMarco did everything except score a TD against Miami last week, this week he faces a Browns team that are in year one of a rebuild. He is the centerpiece of a Tennessee offence that could tee off on a weak Cleveland team this week and you would expect big points from him. 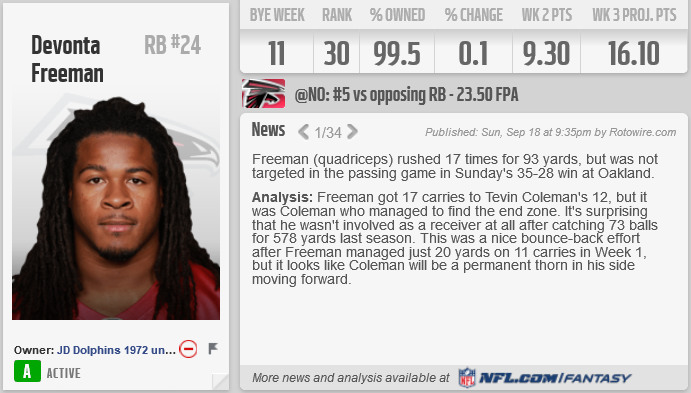 Alongside him is Devonta Freeman, part of the best one, two RB punch in the NFL right now. He faces a Seattle team that is starting to get things going this season. He is projected to pick up 9+ points which may be a little low considering his combined 30.70 points against the Panthers and Broncos over the past two weeks. Opponent - Eddie Lacy & Jordan Howard (Proj. 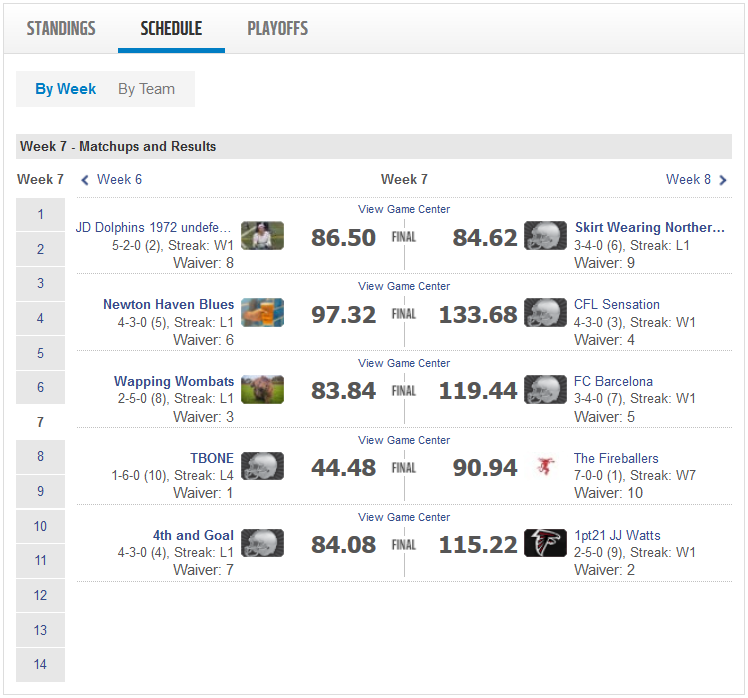 27.50) - Gary claimed Jordan Howard ahead of me on the waiver wire, I ended up with Theo Riddick as my backup instead. The Bears' round five pick has been a revelation since becoming their number one back and he will look to continue this against Jacksonville. The Jags haven't been brilliant against the run so far but on their day they can cause problems for the run game. Eddie Lacy has a tough game against Dallas, if Aaron Rodgers is as good as he used to be then it should open up the game for Lacy a bit, unfortunately Rodgers hasn't quite been himself so far this season. Let's hope it continues another week. NFL.com really don't like Crabtree and Hopkins this week. Crabtree has been a guaranteed 3 catches and 10 points every week so far this season and has something good going with Carr, but that is only worth 6.10 points to them. Hopkins and Osweiler finally connected for a TD in garbage time last week against the top defence of Minnesota after two awful weeks. He faces the much friendlier prospect of the Indianapolis secondary this week and you would like to think he could put up 10+ points again this week. 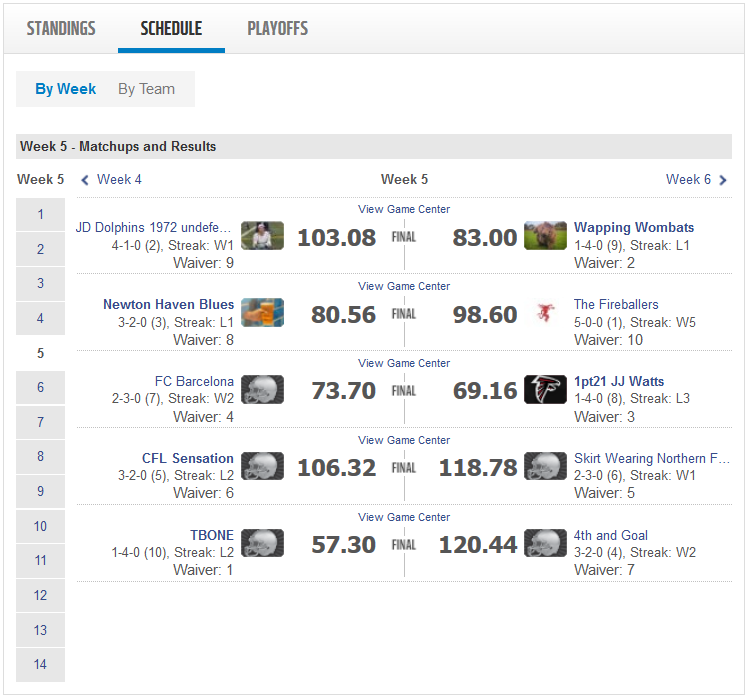 Opponent - Brandon Marshall & Antonio Brown (Proj. 22.20) - Somehow Brown is only down for 8.90 points this week against the wet paper bag that is the Miami Defence. Brandon Marshall is projected to get 13+ points against Arizona on Monday Night... flip these points around and I think you have a more accurate prediction for these two players, although both could easily top 10 points this week. This may be a bit ambitious considering Jacksonville have been pretty tough on TEs this season but with the number of opportunities Hoyer could give him I could see Miller putting up 10+ points, especially if he can grab a TD. Miller will need a big game again this week otherwise I may return to the TE roulette game next week. Opponent - Jordan Reed (Proj 0.00) - Reed is in the concussion protocol and not expected to take the field on Sunday. He had a tough match-up against Philly regardless but it would probably be best for him to sit out this week. Opponent - Will Fuller, WR (Proj. 11.10) - Fuller is battling a hamstring injury after a quiet showing against Minnesota. The rookie has blown hot and cold this season, and with more tape on him his opponents are forcing him to make adjustments. He is still a decent choice for the flex position and around 10 points is a reasonable expectation if he is on a hot week. Once again Bryant gets no love from the so called "experts". If Atlanta put up points, he puts up points. Simple. Opponent - Steven Hauschka (Proj. 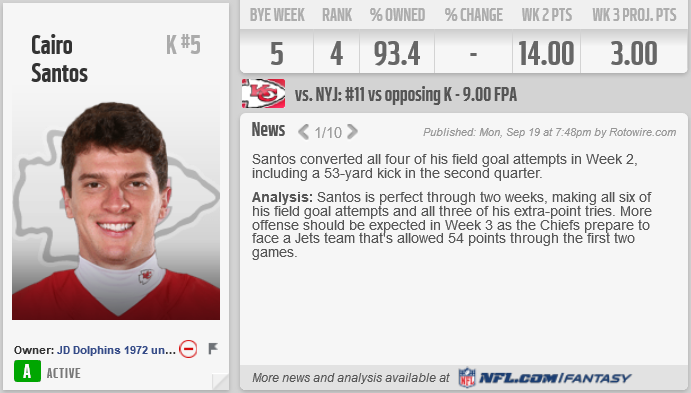 8.00) - Second week in a row that both kickers are involved in the same game. 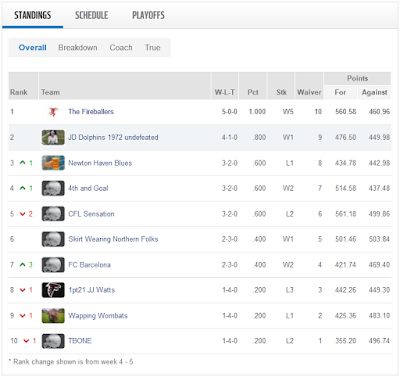 Second week in a row that my opponent is predicted to have the better kicker Hauschka is a long way down the list of kickers (18th) and shouldn't even be in the conversation with Bryant this year. Any other year he would be expected to be ahead... But not this year. I considered picking up the Tennessee defence for one week against Cleveland this time out but I stuck with LA after Detroit appeared to lose yet another RB to injury. This time Theo Riddick who had a big first quarter last week before getting very quiet. He hasn't trained all week and seems doubtful for Sunday. LA will be hoping to shake off their injuries and get back to their strong defensive play after a tough outing against Buffalo last week. I just hope Jeff Fisher doesn't sink them with a bad coaching call again. Opponent - Arizona Cardinals (Proj. 6.00) - This should be a good match-up for Gary. New York have put up a total of 33 points in three losses over their last three games (that's an awful lot of 3s). If they can shut down Brandon Marshall Arizona should come away with a W. Of course doing so could undermine Gary's team as a whole, it's never fun when Fantasy Football throws something like that at you.